On Wednesday, June 28, Leading From Within was honored as a Nonprofit of the Year at a celebration of California Nonprofits Day at the State Capitol in Sacramento. Leading From Within was selected by State Assemblywomen, Monique Limon (D-Santa Barbara) as an exceptional nonprofit organization in the 37th District community. 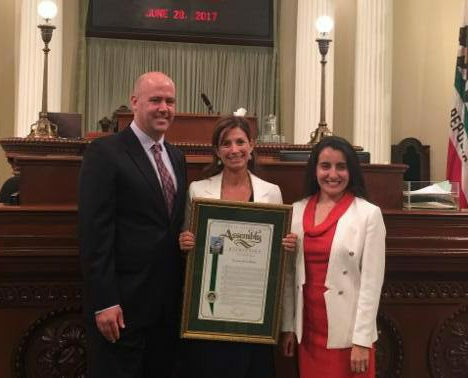 We were joined by nearly one hundred other nonprofit leaders from across the state being honored at the annual California Nonprofits Day event, formally recognized by Assembly Concurrent Resolution 54, authored by the chair of the new Assembly Select Committee on the Nonprofit Sector, Assemblywoman Monique Limón. Monique is an alumni of the Katherine Harvey Fellows and a former Leading From Within board member. “Though less than a decade old, Leading From Within has built a community of more than 300 regional nonprofit leaders, and provided a space for learning, collaboration, and mutual support. Leading From Within is a remarkable example of the creativity that thrives in our nonprofit sector,” Geoff Green. Geoff Green, also a Katherine Harvey Fellows alumni, is the Board Chair of California Association of Nonprofits (CalNonprofits). CalNonprofits worked with the State Assembly to support California Nonprofits Day. They are a statewide alliance of over 10.000 organizations representing California’s growing nonprofit sector. Thank you to all our donors and leaders, for making this recognition possible.